For the last week or so I’ve been making the joke that Horizon Zero Dawn is an open-world game whose major innovation is that the towers that you climb to uncover the surrounding area on your map now walk slowly around the map themselves. This crack is only slightly unfair. In terms of mechanics there is almost nothing surprising about Horizon Zero Dawn as it fuses bits and pieces from the rest of the genre together into something that developers Guerilla Games are clearly hoping will turn out to be more than the sum of its parts, and my initial impressions of the game were somewhat unfavourable. It looks absolutely stunning, to be sure1, but aside from the robot dinosaurs there didn’t appear to be a huge degree of difference between it and Far Cry Primal. Does the world really need another fairly standard open world game, even one as pretty as Horizon Zero Dawn? Well, as I got further and further into the game I was a little surprised to find myself enthusiastically nodding “Yes!” as I became increasingly drawn into its world. It gets by on two major strengths, one of which is somewhat more prosaic than the other. First, if Horizon Zero Dawn has stolen mechanics from other open world games, it’s at least had the good sense to only steal the ones that work, and it’s had the time to polish those mechanics to a fairly high standard of quality. It’s got climbing, crafting, searching for collectibles, it’s stolen the Witcher Senses mechanic from Witcher 32, it’s got a selection of both robot and organic wildlife that you murder to get animal bits to build bigger bags to hold all your animal bits, it’s got the aforementioned towers – when you list it out on paper it certainly sounds very standard and unoriginal, but it’s the genre standard for a reason and Horizon’s high level of polish really does make a big, big difference. To continue the metaphor, this is a sleek, genetically-engineered apex predator of a game rather than the Frankenstein’s monster it could have easily turned into. There are some rough edges that I have ranted about at length in various kitchen conversations and I’ll cover the ones I think are genuine problems in detail later on, but if you are at all into open world games then I have a high degree of confidence in saying you’ll probably get on with Horizon Zero Dawn. It’s the second strength I’d like to spend some time talking about, though, as it’s an entirely unexpected one: Horizon Zero Dawn is a masterclass in how to tell a rich, compelling, and tragic story. Interestingly, though, this is not the story of Aloy, the game’s main character, even though her background is tragic enough. 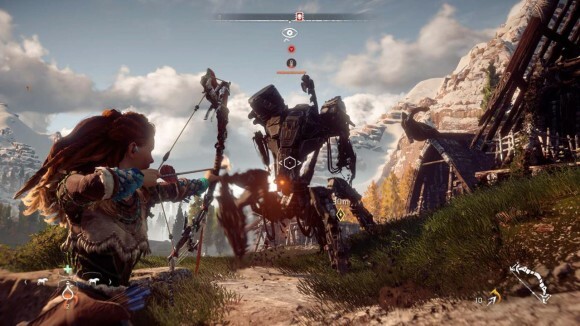 Horizon Zero Dawn takes place in an unusually idyllic post-apocalyptic world that’s shared by technologically-advanced (and increasingly aggressive) robot wildlife and a set of human tribes with a technology level that’s somewhere between the Iron Age and early Medieval period depending on who you talk to. 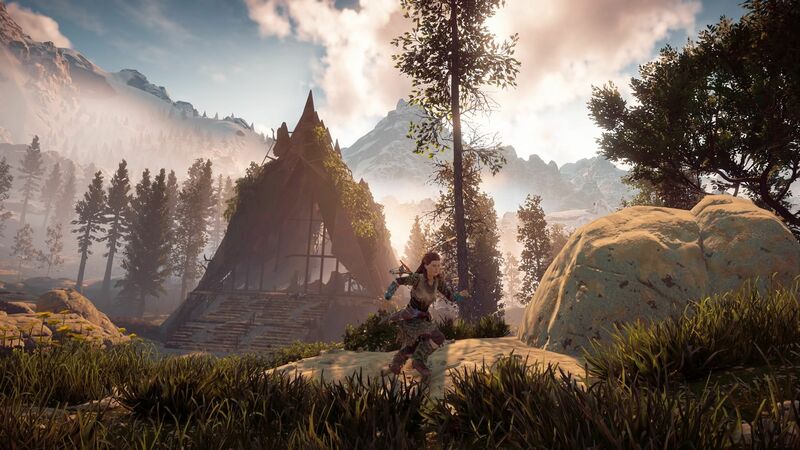 Aloy is a child of the Nora tribe who was birthed in mysterious circumstances that have caused her to be branded outcast and handed off to the similarly-outcast hunter Rost to be trained in all of the things you spend your time doing in an open world game. Spurned by the tribe, Aloy is nevertheless hell-bent on finding out who her mother is and wins the tribe’s coming-of-age Proving ritual so that she can finally talk to the rest of the Nora, only for the Proving to be attacked by mysterious cultists who are specifically targeting her for assassination. 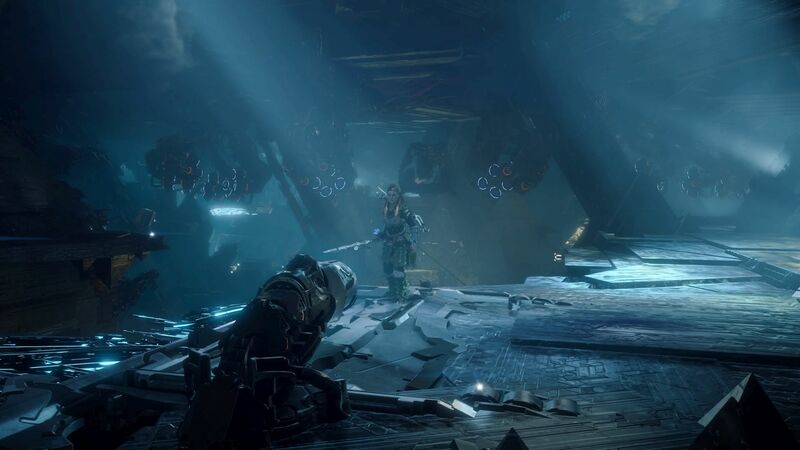 This triggers a copious dump of plot and also incidentally kills off Rost, who is a fairly generic father figure/mentor character with a built-in expiry date of “The end of the tutorial”, making Aloy a true orphan and giving her another reason to go out into the wider wild and uncover who she really is. So far, so open-world. However, Horizon Zero Dawn’s story is actually two stories woven together. The first is Aloy’s trek through the world to track down the cultists and the man who killed Rost, and this is perfectly functional and even has some pretty snappy dialogue at times. Aloy herself is very likeable and rational, and always feels like she’s a real person reacting in a real human way to events rather than doing things because she’s suddenly become Plot Stupid. 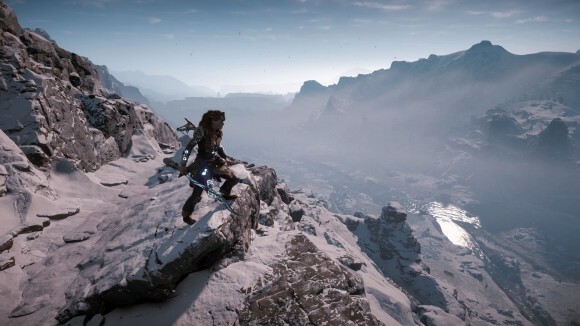 The various cultures she meets and interacts with are extremely non-standard for a mainstream AAA title and there’s a lot of thought that’s gone into building the recent history of this world — enough that Horizon Zero Dawn would probably be worth it just for this exploration of the world as it is now, even though most of the main plot beats are distressingly conventional. The thing is, though, this is a post-apocalyptic world, and one that has somehow given rise to weird robot dinosaurs to boot, and the circumstances behind Aloy’s birth turn out to be inextricably linked to events that took place before the world somehow got reset. She spends a lot of her time combing through ancient buildings and facilities to uncover files and recordings left behind by humans before, during, and just after the apocalypse, and over the course of the game manages to piece together just what happened. It’s this story that deeply impressed me. 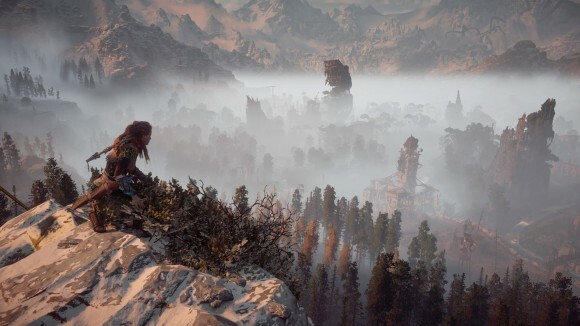 It’s a story told through the hoary old standby of text files, audio logs and holographic recordings, but Horizon Zero Dawn somehow manages to turn this into a strength, painting a picture of the end of the world with enough broad strokes that the player’s imagination effortlessly fills in the blanks, and combining it with the experience of spelunking through the ruins of a near-future human civilization to make it as much about the process of discovery itself as it is finding out what actually happened. Much like the rest of Horizon it’s not entirely original — it’s an old enough concept in sci-fi that The Talos Principle covered some of the same ground — but the circumstances are somewhat more horrifying/depressing (if you can grade apocalypses on how depressing they are) and the human response commensurately more extreme; it says a lot about it that it managed to draw a straight line between human civilization now and techno-vikings fighting robot dinosaurs hundreds of years in the future without snapping the thin thread suspending my disbelief. I would like to spend several more paragraphs talking about why I liked this part of Horizon’s story so much, but I can’t discuss it in more detail without getting spoilery. Suffice to say that it’s a far better hook than any of your Far Crys or your Assassin’s Creeds have ever managed, and it was more than enough to keep me invested in the game throughout the 30-odd hours it took for me to play it to a reasonable level of completion; I dare say I’ll remember Horizon Zero Dawn’s story long after I’ve forgotten what most of this generation’s AAA titles are even called. Instead I’m going to talk about the combat — and by extension the equipment system — because this is where the vast majority of the actually-original game design lives in Horizon Zero Dawn. Fighting human enemies is the usual dull experience of headshotting them as they either peek out from behind cover or run towards you in a straight line, which is why it’s a damn good thing the robot dinosaurs are in the game. I keep calling them dinosaurs but most of them are based off of existing wildlife — robot horse, robot antelope, robot buffalo, robot crocodile etc. The smallest ones are pretty simple to fight as you just shoot them in the face a few times and they’ll fall over, but most of them aren’t small. For example, the robot buffalo is about three times the size of a regular buffalo, and if you’ve ever seen a regular buffalo you’ll know those aren’t exactly slouches in the size stakes themselves. 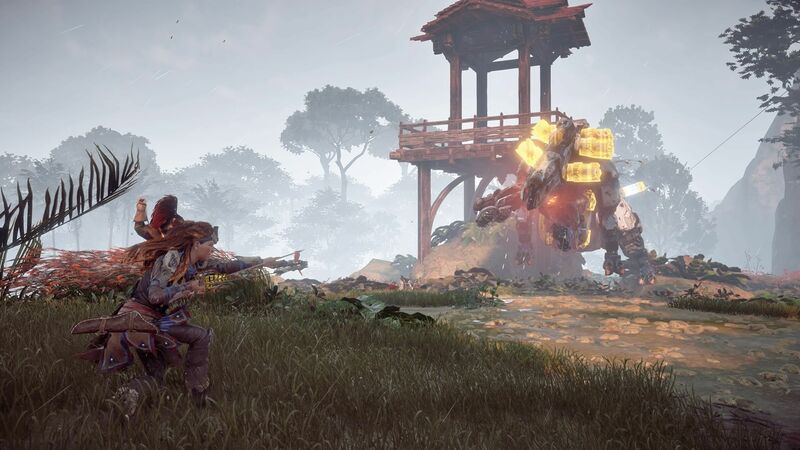 As their size scales up they take more and more punishment, to the point where simply shooting them full of arrows would take far, far too long to put them down, and this is a significant problem when most of the bigger ones can easily kill Aloy in just two or three hits. 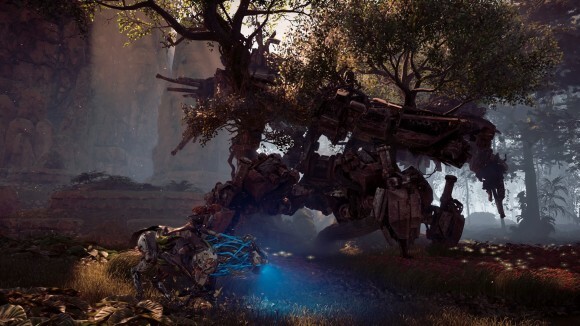 Instead Horizon Zero Dawn would like you to approach combat with its various artificial beasties a little more cerebrally, and it gives you the tools to do so. You start off with a fast-firing bow that does sod-all damage to even the weakest enemies unless you hit a weak spot, and a spear. The spear is also useless against anything larger than a large dog. However the bow does have the ability to shoot fire arrows at enemies, and scoring a hit with one will apply a brief damage-over-time (DoT) effect and also start filling a small elemental damage indicator over the target’s head. Hitting them with more fire arrows fills up the indicator further, and when it’s full they’ll positively erupt into flames, incurring a much larger DoT that goes on for longer and also potentially stunning them for a few seconds. Much of the combat is supposed to be based around applying these effects intelligently; freezing a robot will cause it to take more damage, while shocking it will stun it for a long time. You get traps that you place on the ground to cause fire or shock damage; tripwires you can deploy that do the same; ropecasters to tie fast and/or flying enemies down in one place to make them easier to hit. The part of the combat that isn’t based around doing elemental damage instead involves sharpshooting; scanning an enemy will reveal a number of components that either act as weak spots, or which can be shot off the robot to deprive it of one of its attacks. You even get a special ammo type for one of your bows that does no regular damage but deals massive Tear damage, often blowing off a component in one hit. When this system works, it works incredibly well. Take the Thunderjaw as an example, which is the actual big robot dinosaur featured in a lot of the promo material. It has two back-mounted disc launchers that fire robot drones with a nasty laser attack, a radar mounted next to the disc launchers that will locate you if you try and hide in tall grass, two laser cannon adjacent to the mouth, and a spiked tail that can deal massive damage in melee and often one-shots you. It also has buckets and buckets of health and is armoured in most places; hitting an armour plate does only 20% damage, so blowing off the armour is also recommended. After fighting a couple of them I learned to hit it with Tearblast arrows until the disc launchers, the radar, most of the armour and — this is important — one of the mouth cannons were gone, and then to hit it with fire arrows and regular arrows until it went down. The reasoning behind destroying just one mouth cannon is that it’s practically impossible to hit the tail, and if you destroy all its other weapons it makes the incredibly deadly tail attack far more frequently. If on the other hand you leave it with a single cannon it’ll just try and shoot you with that all the time, which isn’t so bad if you’re half-decent at dodging and will buy you the time you need to whittle it down. Unfortunately the system isn’t always this elegant – in fact, it almost never is. Mostly this is because of the way you upgrade weapons; replacing a weapon with a more expensive variant gives you more functionality, such as the Tripcaster getting the ability to deploy blast and fire tripwires, but the shock damage caused by the Tier 3 Tripcaster’s shock wire is exactly the same as the shock damage caused by the Tier 1 Tripcaster. Instead, you’re supposed to boost the damage of your weapons through modification items, which are given as quest rewards/dropped from tough baddies and plugged into a limited number of slots on the weapon. These will usually boost one specific damage type, but the problem here is that each weapon does up to three different damage types depending on what sort of ammo you’re using. You could drop in one upgrade boosting each damage type, but this is not a solution that scales very well, especially once you start facing multiple big robots at the same time. Instead it’s best to boost one type of damage above all others so that you can apply the associated debuff (or just do damage) as quickly as possible, which for me ended up being fire damage on the fast-firing hunter bow, regular damage on the sniper bow, and shock damage on my Tripcaster. Even then the Tripcaster couldn’t do enough shock damage to reliably apply the Shock effect on large robots so I ended up relying on Tearblast and fire arrows alone. This is the big flaw with Horizon’s equipment system: they throw all of these tools and tricks at you, only for you to discover that most of them don’t – can’t – scale into the mid- to -late game, forcing you to specialise in one very narrow set of things in order to down things in a reasonable amount of time. The intent was that I play combat encounters like the Vietcong, taking time to set up traps and tripwires and then drawing the enemy into a prepared ambush. Instead I ended up playing it more like the U.S Army by dropping napalm absolutely everywhere to try and burn everything to the ground as it was the one DoT I had that was reasonably effective. For big boss robots encountered singly, like the Thunderjaw, it’s better to take the time to degrade its offensive capabilities before moving in for the kill, but for everything else I just wanted it constantly rolling around on the ground on fire because that way it wasn’t jumping at me from behind and tearing my head off; it’s incredibly easy — and frustrating — to get swarmed by multiple enemies in HZD, especially since their attacks will always hit you unless you’re incredibly precise with your dodge timing. Still, while you’re forced to specialise more than I’d like the scope does at least exist to find a build that works for you. This build let me brute force a lot of the encounters, but I did notice that a lot of robots took huge damage if you waited for the right moment for a very precise shot; shooting a Snapmaw as it opens its mouth to belch liquid nitrogen at you will freeze it rock solid and makes it relatively easy to put down, and there are plenty of other robots with reactions that are just as spectacular. It’s just that you need to learn these weaknesses through actually fighting them, and since I spent nearly all my time in combat peppering the robots with fire arrows I didn’t often see what happened if you hit them with other types of ammo. There is definitely depth here for somebody who knows the enemies and their attack patterns. It’s just that, even after 30 hours played, I don’t think that somebody is me. Ah well. While the way the equipment and the combat interact is definitely flawed I don’t think it’s by any means bad. Frustrating at points until you get your head round it (I couldn’t understand how dodging worked for the longest time), but definitely more interesting to interact with than most other open world combat systems I’ve encountered. What I especially liked was that even at the end of the game fighting the robots was never trivial. Each encounter with everything that wasn’t the crappy early game Watchers or Scrappers at least ran the risk of me losing a lot of health, and I was shocked to find that even my level 45 uber-hunter sometimes still got taken out by robots that I’d been fighting for the last 20 hours simply because they managed to blindside me. They always feel like big tough enemies that you only fight if you have to and which are better avoided if at all possible, which makes exploring the more remote parts of the world map a little bit exciting as you try and sneak up to a Tallneck without aggroing the four Longlegs that are patrolling nearby. In the end I think Horizon Zero Dawn makes a good enough fist of everything it attempts that I’ll forgive it for being, under the hood, yet another open world game where you run around the map hoovering up points of interest. It’s sophisticated enough in both its storytelling and in the moment-to-moment gameplay that the macro-structure of the game being so damn conventional is far less of an issue than it might be otherwise. This wasn’t readily apparent at the start of the game when the plot had yet to really get going and I’d yet to fight anything bigger than a Sawtooth, and I was steeling myself to try and get as far with it as I could before I inevitably got bored and gave up; instead I’ve found myself mainlining the last half of the game over the last two days and enjoying almost every minute of it. Ultimately I think that the story is by far the best thing about it, as it provides what most open world games are missing: a genuine reason to explore that goes beyond ticking up icons and filling up a percentage completion meter. This world is as alien to Aloy as it is to us, and uncovering the secret history behind it is a very compelling reason to flit around picking up all the collectables3. Sure, it’s not quite The Witcher 3, but Horizon Zero Dawn is definitely the best argument for buying a PS4 that I’ve seen so far. > Horizon Zero Dawn is definitely the best argument for buying a PS4 that I’ve seen so far. Funnily enough, I was thinking if it ended up being good then I’d take the plunge and buy one. I hear the animation quality is somewhat better on a PS4 Pro. Granted this is a somewhat specific question, but do the audio logs etc. get saved in a menu / journal somewhere for later reference or do you just play them where you find them? I like the idea of maybe playing it at a very slow pace.